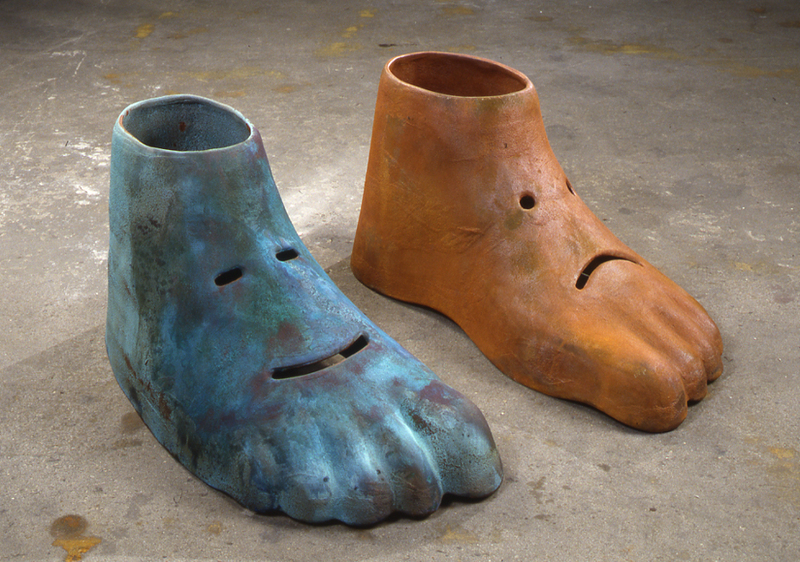 This is a pair of sculptures from a series of seven pairs of mask/feet completed during a residency at the Arts Industry program of the J.M. Kohler Art Center at the Kohler cast iron foundry in Kohler Wisconsin. The work actually was conceived, as most of my works are through a process of meditation, dreaming, and other hard to explain intuitive practices. Once I began to think more consciously about the work I saw it as a reflection of how world history is made up of all the little accumulated personal histories as they interlock and overlap around the world. 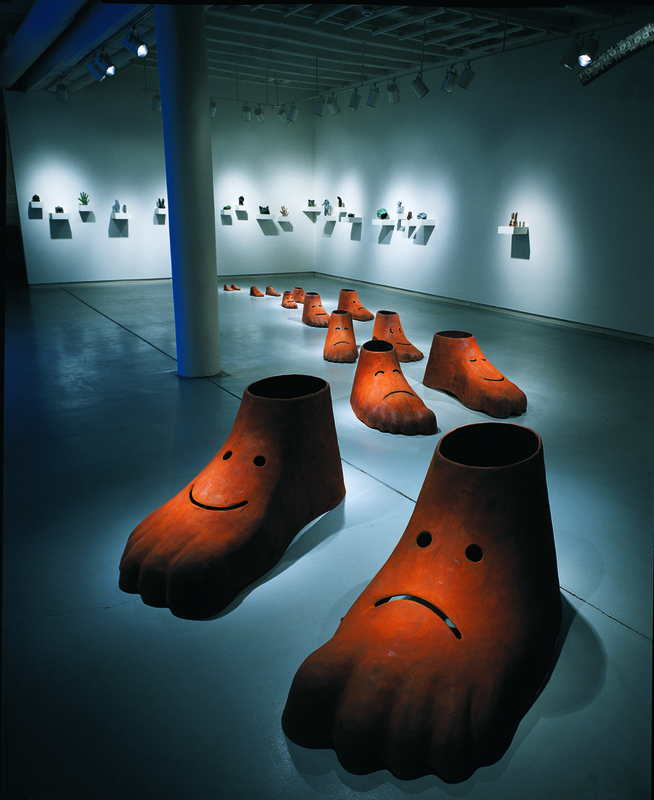 I think I used the image of feet since that is what we travel around the earth on making our little histories. 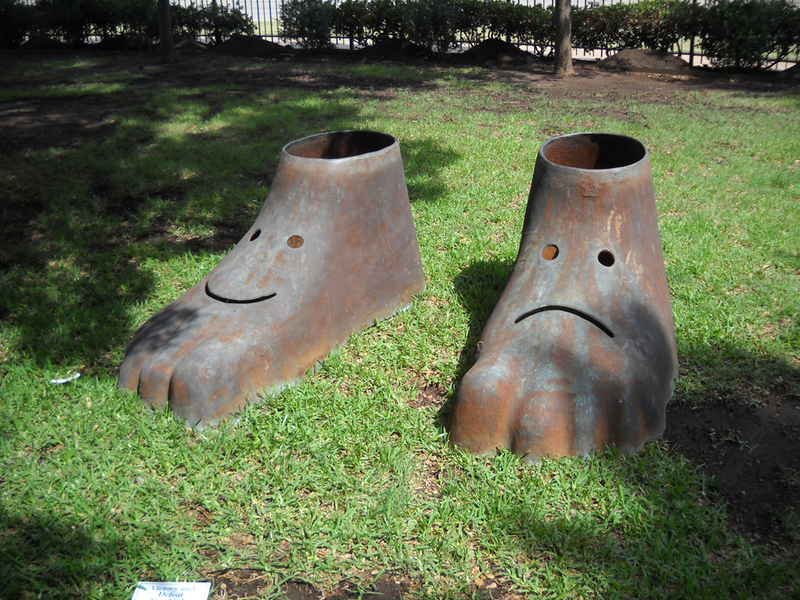 I also liked the fact that they were made of iron, which came out of the earth, itself. I must have put a smiling face on one and a frowning face on the other to reflect the successes and failures of each generation? In the long run none of that may make any difference. It is a piece of sculpture that will stand on it’s own. No pun intended. "Victory and Defeat" (weathered) after years of exposure to exhibitions outside at the Navy Pier, Chicago, Illinois, The University of Texas at Tyler, Luminaria, San Antonio, and more.